Place chuck roast in crock pot. In a medium sized bowl, mix remaining ingredients. Pour over roast. Cook on low for 10 hours. If using a 4 lb roast, add a 1/2 soup can of water. 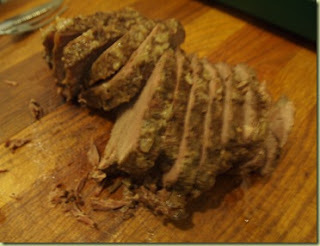 Once cooked, shred beef and place on rolls that have been toasted under the broiler. Place a piece of provolone (or cheese of your choice) on top of shredded beef. Dip in broth from the crock pot and ENJOY! I would guess that you should use at least a 3 – 4 quart crock pot. Just make sure your roast fits in the crock pot nicely, not overcrowded or too full once the soup mixtures are added. The leftovers would make great meat pies or barbecue. Thanks for sharing Carrie! I can’t wait to give these sandwiches a try.